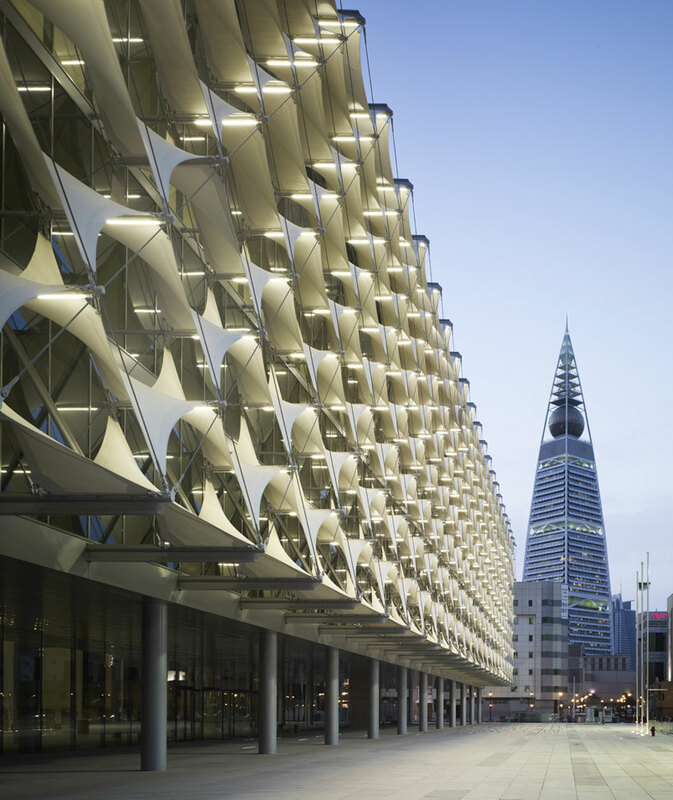 architecture in saudi arabia surveys the contemporary condition of the country’s built environment, showcasing a range of innovative projects and the diverse materials and unconventional forms employed in their construction. 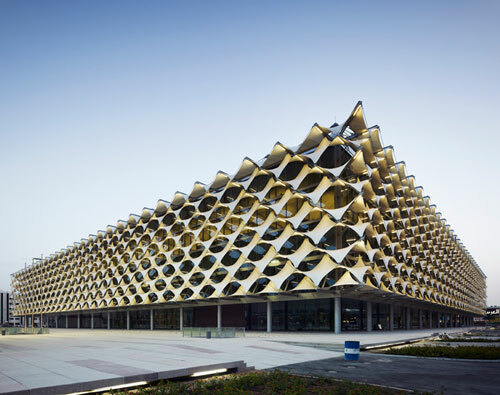 saudi arabia’s ‘king fahad national library’ has re-opened its doors to the public, ten years after german practice gerber architekten won an international competition to complete the project. 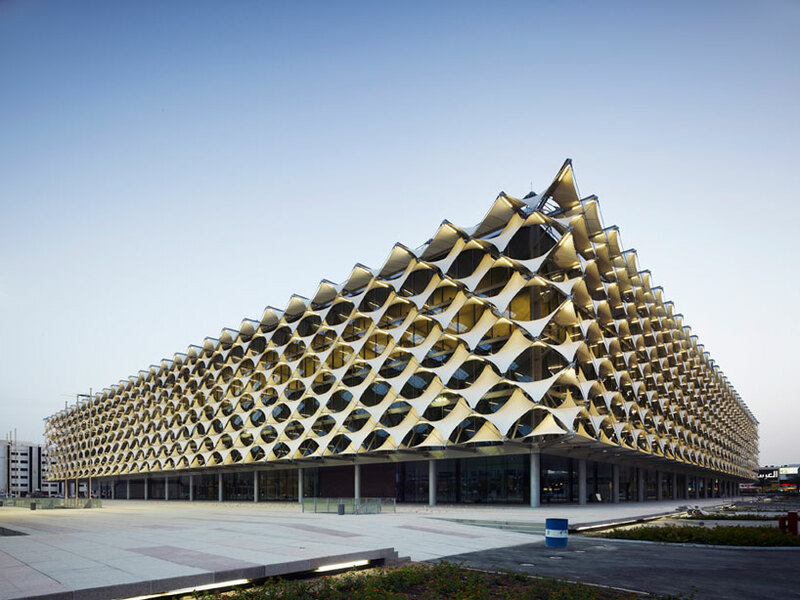 the design involves the refurbishment and extension of the existing building – one of the most significant cultural centers in the region. 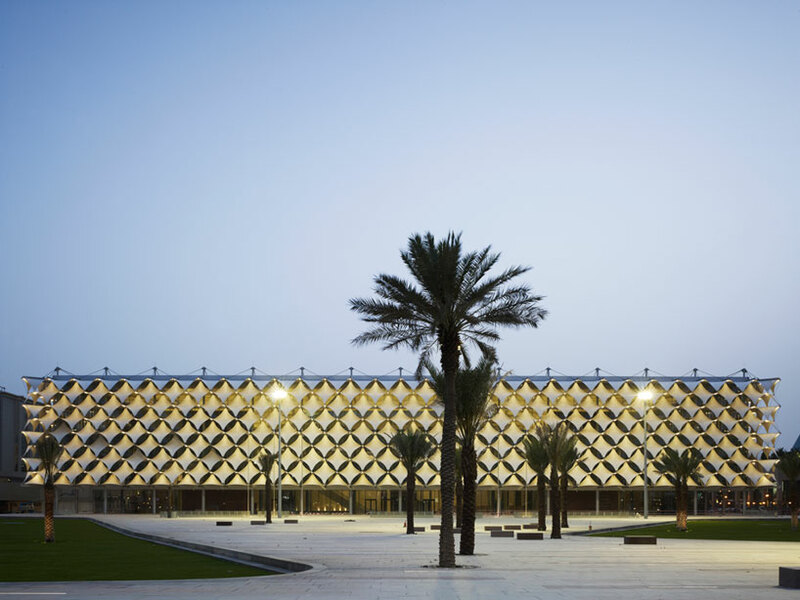 situated in riyadh, the country’s capital, the scheme is part of a larger urban scale development programed to facilitate interaction, collaboration and study. despite its size the structure forges a connection with the surrounding landscape, forming the centerpiece of a new urban park. importantly, the scheme respects the history and heritage of its location, echoing elements of arabian culture throughout the design. 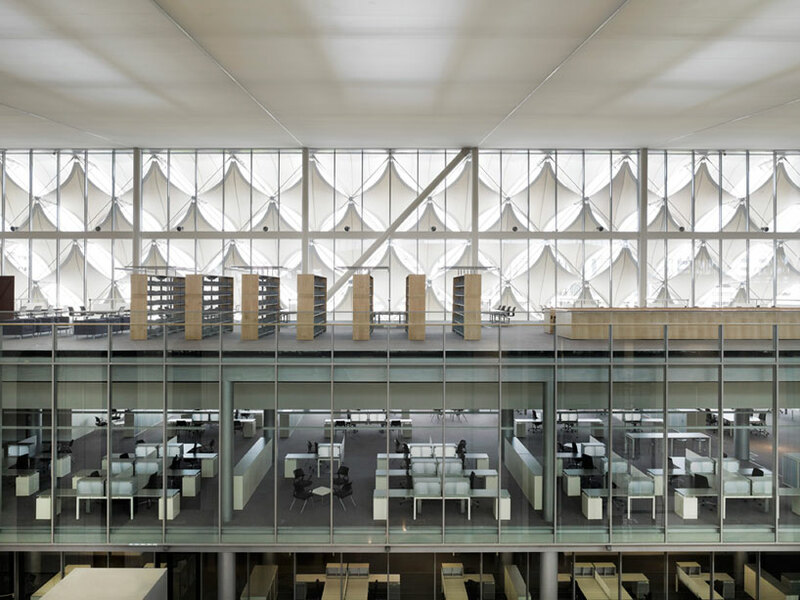 the cuboid shape of the new building surrounds and protects the existing structure, creating a new series of elevations. 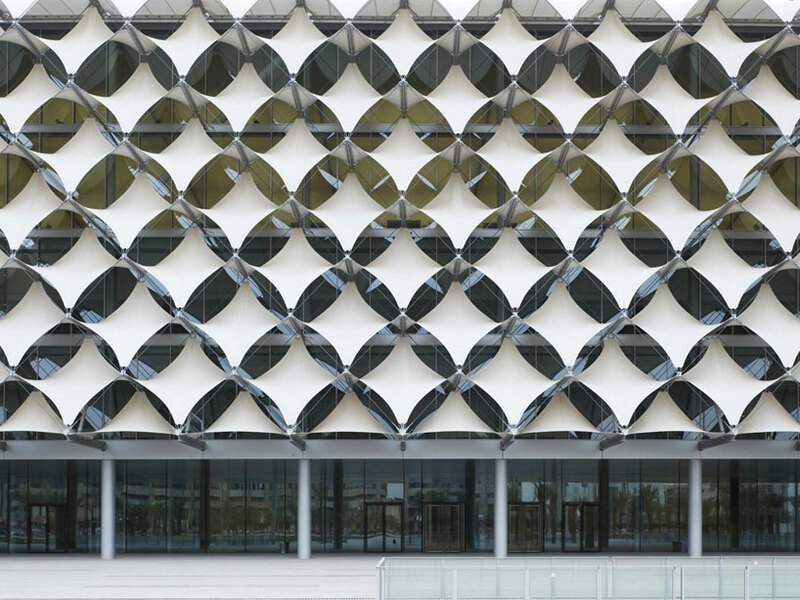 the library is characterized by its filigree textile façade, a cladding made up of rhomboid awnings featuring traditional middle eastern architectural patterns. 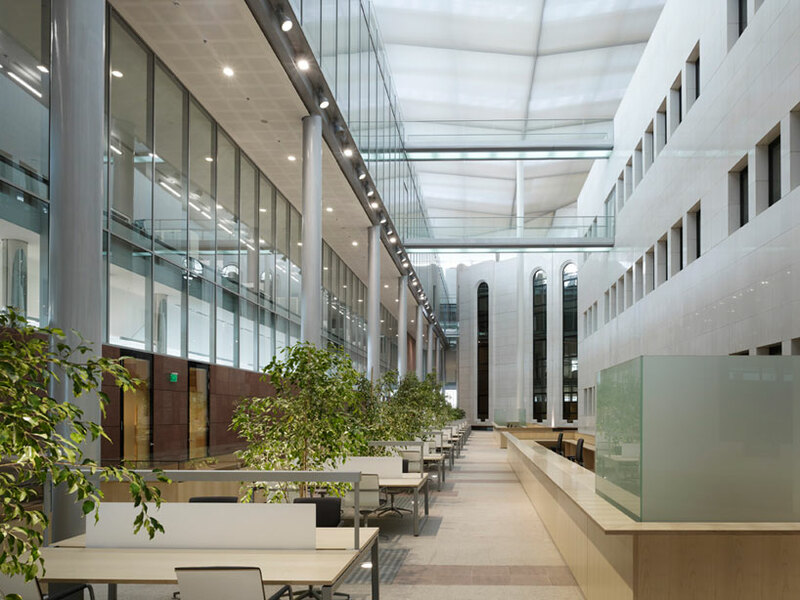 throughout the interior, brightly lit, comfortable spaces provide a tranquil and calming atmosphere which encourages contemplation and the exchange of knowledge. the main entrance hall is located at ground level, alongside exhibition areas, a restaurant and a bookshop. at the first floor there is a separately accessible area specifically for women in which female guests can spend time without a burka. the various book depositories are seen as treasures to be found within the building’s protective exterior. 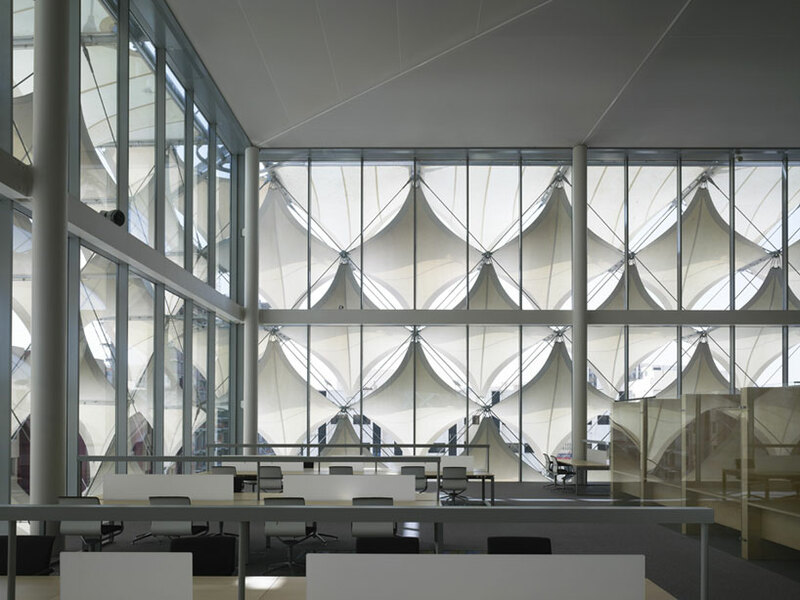 the façade’s white membranes, supported by a tensile-stressed steel cable structure, serve as sunshades and reinterpret traditional patterns with more technologically advanced solutions. 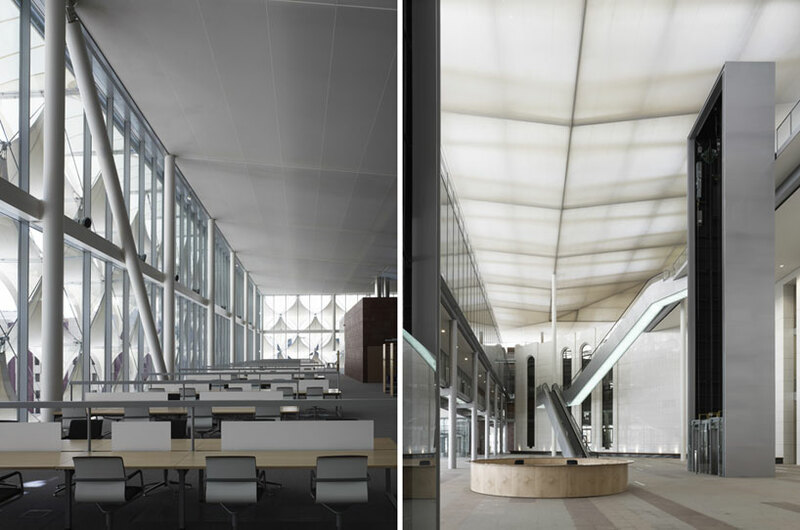 the envelope’s orientation and design responds directly to the local sun path, combining the required protection from the hot sun with maximum light penetration and transparency. at night the building is illuminated with changing color patterns, standing as a cultural beacon for the region and its people.